1. The opening of accounts is subject to status. 2. 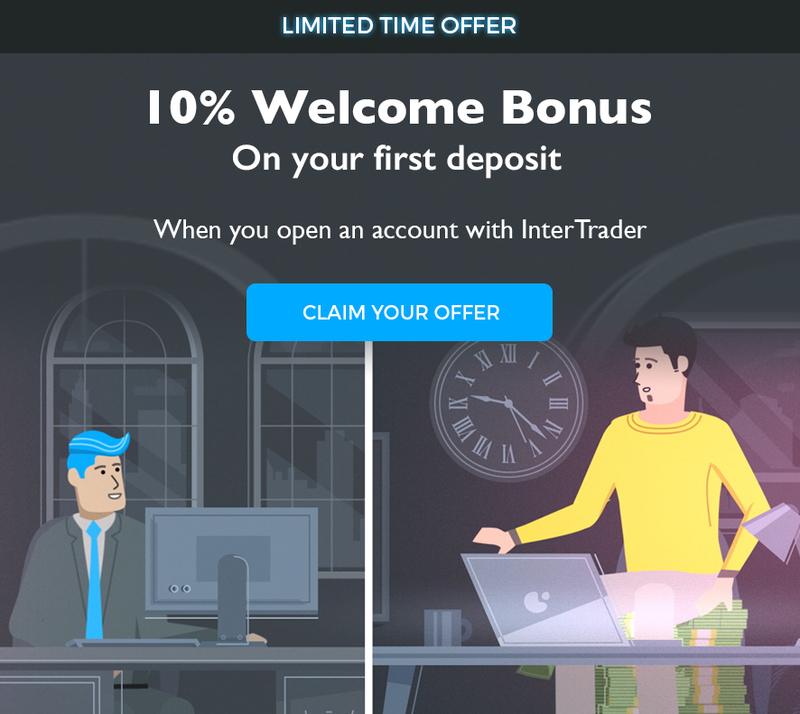 This offer is only available to new customers (and clients explicitly invited) who successfully apply for an account with InterTrader and who have not previously held an account with InterTrader. This offer can only be applied to one account per customer. 3. This offer is not available for equities. 4. This offer cannot be used in conjunction with any other offer, unless explicitly stated in the terms and conditions of that particular offer. 5. This offer runs until 23.59 (CET) on 31st June 2018 (“Closing Date”). In order to qualify for the bonus you must have opened an InterTrader account, met the relevant criteria and requested the bonus before the Closing Date. 6. InterTrader will credit your account 10% of your initial deposit if over $/€/£500 up to a maximum of $/€/£10,000. The “initial deposit” can be a series of consecutive deposits made within 5 working days of the first deposit (“Initial Deposit Period”) provided that the aggregate amount deposited during the Initial Deposit Period is more than $/€/£500. Once you have claimed your promotional bonus offer you will not be able to make any further claims in respect of this offer. 7. Once you have deposited funds please contact your Account Manager or the Customer Support team (support@intertrader.com) in order to request that the promotional bonus be applied to your InterTrader account. Your deposit amount will be calculated as the total sum deposited in the Initial Deposit Period less any withdrawals during that period. Your promotional bonus amount will be dependent on your deposit amount and will be calculated using the table above. 8. Your promotional bonus will remain in your InterTrader account and may not be withdrawn until all the release criteria are met. 10. If a promotional bonus is applied to your InterTrader account and you subsequently withdraw funds without meeting the release criteria, InterTrader may adjust your account balance by removing the proportion of the bonus amount which was originally credited to your account in respect of the amount withdrawn from the amount standing to the credit of your InterTrader account. Surplus Profit = equity on the account – total net deposits (including bonus). For example, if you deposit £10,000, you’ll receive a £1000 bonus, so you can withdraw anything over £11,000 from the equity balance on the account, before the release criteria have been met without affecting the bonus amount. 11. If you do not meet the release criteria within 90 calendar days of the promotional bonus being applied to your account for promotional bonuses less than £5000, or 180 calendar days for promotional bonuses of £5000 or more, InterTrader reserves the right to deduct the full bonus amount from your InterTrader account (or such proportion of bonus funds and associated winnings as may be available for deduction). 12. We will not be liable for any losses that you may incur as a result of trading with the bonus. 13. This offer is not available to employees of InterTrader, GVC Holdings PLC or any other company engaged in direct competition with InterTrader. 14. We reserve the right to amend, withdraw or restrict this offer at any time without notice. This offer is subject to fair use policy and we have the right to withhold this offer when we have reasonable belief that the offer is being abused in any way, such as the co-operation, collusion and the organisation of trades from the same source. We are the sole arbiter of these rules and any other issue arising under this promotion.